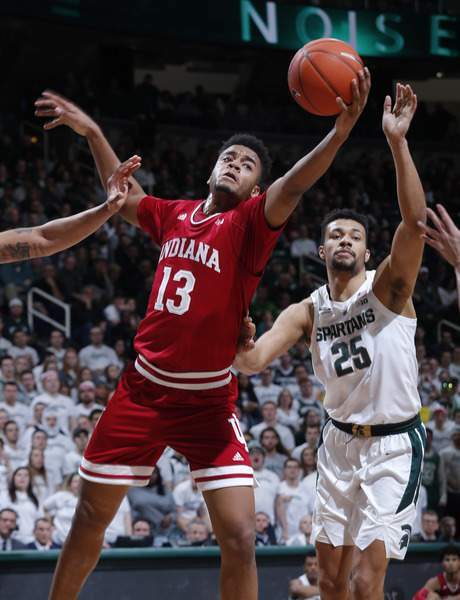 Associated Press Indiana's Juwan Morgan hurt his shoulder against Michigan State on Saturday, but Archie Miller said he "dodged a bullet" with the seriousness of the problem. Indiana pulled out a huge road win over then-No. 6 Michigan State on Saturday, snapping a seven-game losing streak and rekindling hope that this season could end with an NCAA Tournament appearance. The Hoosiers beat the Spartans while one of their best players, senior forward Juwan Morgan, languished on the bench with a shoulder injury for much of the game. Late in the first half, Morgan dived on the floor for a loose ball and got his arm caught, twisting his left shoulder. It was the same shoulder that he'd had surgery on as a freshman. He left the court in obvious pain and did not return. “He probably dodged a bullet,” Miller said. “I think, more than anything with Juwan, there's some concern there because he's had shoulder injuries, a shoulder that went out quite a bit (his freshman year), then it was repaired. It's still unclear whether Morgan will be able to play against the Hawkeyes. The Waynesville, Missouri, native is second on the team with 15.9 points per game and is the Hoosiers' leading rebounder at eight per contest.